Physical activity is an essential health behavior in patients with diabetes and is the one which is least adapted in the Indian context. There is a need to understand the motivators and demotivators of this behavior. 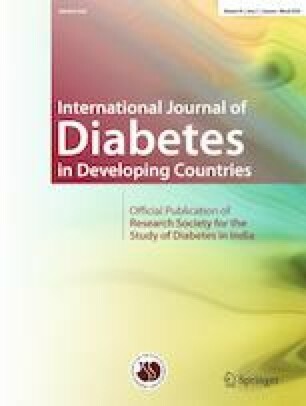 This study was conducted to evaluate the stages of physical activity behavior change, process of change, decisional balance that influences the change and situational self-efficacy in patients with diabetes attending a tertiary care health facility in Chennai, India. Among 150 patients with diabetes attending the tertiary care hospital, selected in a non-random consecutive manner, a questionnaire-based survey was administered covering the domains of stage of change, process of change, decisional balance and situational self-efficacy. About 50% of the sample were not physically active belonging to the precontemplation or the reversal phase. About 23% were in the maintenance phase of physical activity and remaining 27% were in various intermediate stages of contemplation, preparation and action. The dominant dimensions of process of change were dramatic relief, self-re-evaluation and positive reinforcement. There was a high level of perceived pros of physical activity as well as cons and so there was a decisional balance not favouring either end of the behavior change spectrum. Situational self-efficacy levels were low. The perceived pros (OR 1.042; 95% CI 1.005–1.080) and cons (OR 0.929; 95% CI 0.877–0.985) influenced the behavior change in a statistically significant manner in a multivariate adjusted model. A very low proportion of patients with diabetes are in maintenance phase of physical activity with a majority in various stages of change. The patients show various processes of change which all help in moving them through the early stages of change. Perceived pros and cons influence the physical activity behavior change and measures taken to address them are likely to positively influence physical activity behavior. The questionnaire was printed and administered in a pen and paper format, by the principal investigator after obtaining an informed consent from the participants. The study was approved by the Institutional Ethical Committee of the ESIC Medical College & PGIMSR, Chennai, through an expedited review process. Verbal informed consent was obtained from all participants before the interview. Federation ID. IDF diabetes atlas [Internet]. 2015. Available from: https://www.idf.org/e-library/epidemiology-research/diabetes-atlas.html. Accessed 04 March 2019. Colberg SR, Sigal RJ, Yardley JE, Riddell MC, Dunstan DW, Dempsey PC, et al. Physical activity/exercise and diabetes: a position statement of the American Diabetes Association. Diabetes Care. 2016;39:2065 LP–2079. Available from: http://care.diabetesjournals.org/content/39/11/2065.abstract. Accessed 04 March 2019. Sanz C, Gautier J-F, Hanaire H. Physical exercise for the prevention and treatment of type 2 diabetes. Diabetes Metab. 2010;36:346–51 Available from: http://www.sciencedirect.com/science/article/pii/S1262363610001394. Accessed 04 March 2019. Casey D, De Civita M, Dasgupta K. Understanding physical activity facilitators and barriers during and following a supervised exercise programme in type 2 diabetes: a qualitative study. Diabet Med [Internet]. Wiley/Blackwell (10.1111); 2010;27:79–84. https://doi.org/10.1111/j.1464-5491.2009.02873.x. Kirk A, MacMillan F, Webster N. Application of the transtheoretical model to physical activity in older adults with type 2 diabetes and/or cardiovascular disease. Psychol Sport Exerc. 2010;11:320–4 Available from: http://www.sciencedirect.com/science/article/pii/S1469029210000270. Accessed 04 March 2019. Di Noia J, Schinke SP, Prochaska JO, Contento IR. Application of the transtheoretical model to fruit and vegetable consumption among economically disadvantaged African-American adolescents: preliminary findings. Am J Health Promot. 2006;20:342–8 Available from: http://www.ncbi.nlm.nih.gov/pmc/articles/PMC1524879/. Accessed 04 March 2019. Anjana RM, Pradeepa R, Das AK, Deepa M, Bhansali A, Joshi SR, et al. Physical activity and inactivity patterns in India—results from the ICMR-INDIAB study (phase-1) [ICMR-INDIAB-5]. Int J Behav Nutr Phys Act [Internet]. BioMed Central; 2014;11:26. Available from: http://www.ncbi.nlm.nih.gov/pmc/articles/PMC3974063/. Accessed 04 March 2019. Aslesh OP, Mayamol P, Suma RK, Usha K, Sheeba G, Jayasree AK. Level of physical activity in population aged 16 to 65 years in rural Kerala, India. Asia Pacific J Public Health [Internet]. SAGE Publications Inc; 2015;28:53S–61S. https://doi.org/10.1177/1010539515598835.